Some Internet discussions claim that it is easier to push shadows up on one camera model compared to another one. Turns out, such an impression may result from a certain trick. First, let’s see the trick, and next we will expose it. Let’s take a RAW file (from an Olympus E-M1, first version of the camera) and two DNGs derived from it via different means. The difference is immediately visible to the eye (even in the preview), but to facilitate the comparison we’ve set three samplers on each of the screens, probing the same three grey patches of the ColorChecker. Figure 5. ACR. ISO 100. 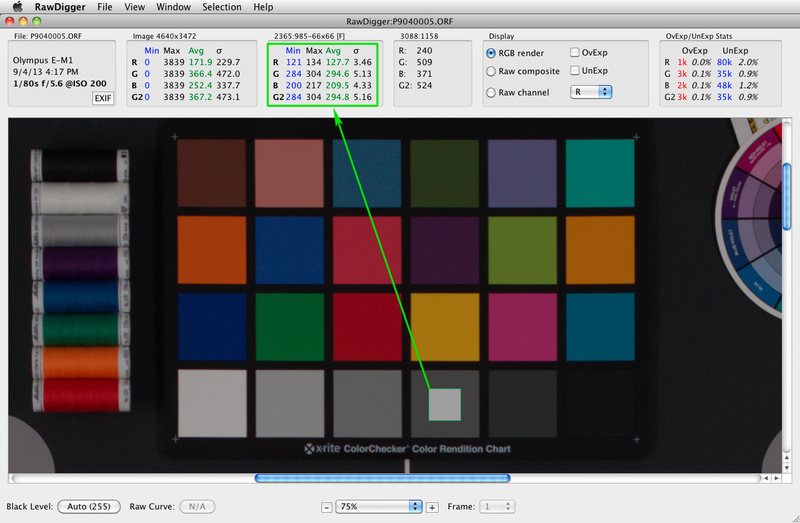 Second samplers' values: for the original ORF (left), Adobe DNG (middle), digiKam DNG (right). If we take the middle of the three samplers, it’s almost exactly middle grey on the first two files (the value = 119), while the third file (value = 162) has a brightness difference coefficient of 1.97, which constitutes nearly an entire photographic stop: (162/119)^2.2 ≈ 1.97, here we take the ratio to the power of 2.2 to un-do gamma, getting the linear values. We will answer this one without further ado. The first, meanwhile (the original ORF), doesn’t contain this tag at all, but the Adobe converter “assumes” it. 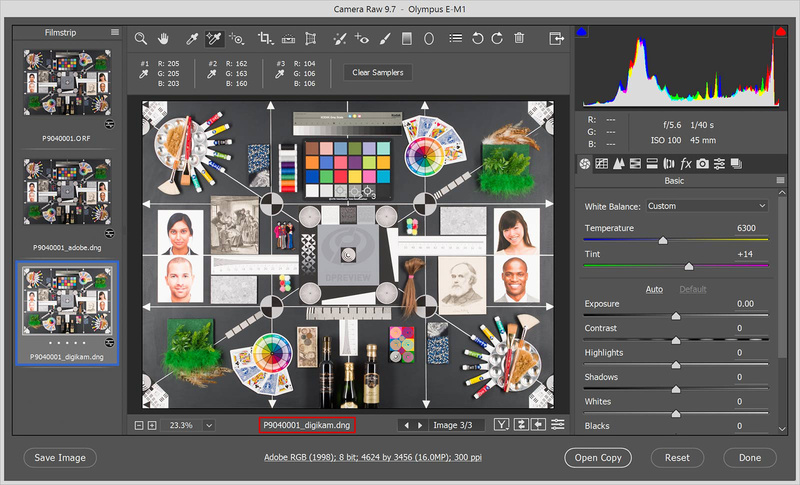 A careful reader, having looked at the names of the files in the screenshots, will know that the third shot was converted to DNG with the aid of digiKam, the second with Adobe DNG Converter (version 9.7). Correspondingly, the Adobe converter set the necessary tag in the DNG (with a value to replicate their own processing of the original ORF file), while digiKam recorded the value as zero. As is plainly visible, the histogram has shifted ~1.2 stops to the left relative of the shot taken at ISO 100 (this can be seen, for example, by looking at the highest peak in the blue channel: it’s around -1.9 EV for ISO 100 and around -3.1 EV for ISO 200). For the first two, the middle sampler on grey shows the same value of 118 as for the first two from the previous, taken at ISO 100. For the third file (which has its “hidden exposure compensation” missing), the sampler value is 102, which is (118/102)^2.2≈1.38x below the middle grey, that is about 0.5 stops ( 2.2*log2(118/102) ≈ 0.46 EV ) darker; while in the first case the difference was one stop in the opposite(!) direction. The original ORF file doesn’t have such a tag, but it is assumed in ACR. or, if they WERE processed in different ways, understand exactly what the difference is and how to get to the lowest common denominator, if that’s the goal. Because, you know, pushing the middle grey up and down for a nearly 1.5 stop total difference (as seen in the examples above), that’s a pretty big deal. This means that, of course, one should first look at the original, unprocessed data (in RawDigger, for example), and only having dealt with the differences there, right in the raw data, to move on to comparing the results of processing. This becomes possible for the simple reason that “ISO light sensitivity” for RAW data isn’t defined in any way. The existing ISO 12232:2006 standard talks about how the out-of-camera JPEG should behave, but doesn’t mention the RAW. In practice, the RAW value that corresponds to middle grey is different for different cameras, even if normalized to the maximum and calculated in percent. Moreover, it can even be different for the same camera, depending on settings and algorithms for Auto Exposure. The proverbial 18% is more characteristic for the ISO settings below the base camera ISO. The current mid-grey in RAW is 12.7% and below, with the emphasis on “below”. ISO 100: 646 or 17% (which is to say ~1.25 steps above the norm for this camera). An ideally exposed shot at ISO 200, the highlights aren’t blown out but are rather hitting the right wall of the histogram. Highlight overexposure at ISO 100. If we take different cameras from the same vendor, then we find out that the middle grey jumps around. For example, the E-M1-II, in regular mode, has it at level 206, which is to say 0.5 steps below than that of E-M1. Meanwhile, ISO 64 mode has the same calibration as that of the camera’s first version (646). So, when using two cameras simultaneously, old and new, one must remember to set and use the proper compensation to the exposure meter readings, depending on the difference in the ISO speed calibration of the modes being used, and the difference in two cameras in regular (not lowest ISO) mode. We like it! How about you? Some might ask: "Why do they (camera manufacturers) do this? ISO numbering (for the same operation mode) can be drawn higher, which is useful for marketing. The headroom in the highlights increases, we won’t blow out all of the specular highlights, and the highlights can be compressed with an S-shaped curve, making the result closer to what photographers had on a film negative. As a result of the shift in middle grey to an area with weaker signal (in effect, forcing under-exposure), the noise increases. Modern cameras have little noise (relative to what it was 5-10 years ago) and this cost is considered worth it. But this cost has to be paid always (when shooting “according to the exposure meter”), even with low contrast scenes, which don’t need extra room in the highlights at all. What Happens Later, after the Shoot? The in-camera JPEG engine returns the middle grey to its proper place, because the standard ordered it to. The designers of RAW converters are forcibly doing the same because their (mass) user expects to see, upon opening the file, the same thing that he sees on the back of the camera (and if that doesn’t happen, then they’re flooded with questions, one of the most common for new RPP users being “why is everything so dark?”). For original RAW files (not DNG), hidden exposure compensation is implemented. In this way, the difference in hidden exposure compensations comes to 1.16EV. While we are on it, let’s take a look, for example, at the RAW values for the green channel on the same grey patch we already sampled in ACR as middle grey, 118. This means that it’s a difference of a magnitude of 2.26 or 1.17 stops, which, very accurately, coincides with the difference in the BaselineExposure tags or the above-calculated difference in the SensorCalibration tags in the ORF files. Meanwhile, if we look at the render of the un-corrected DNG render, we see values of 162 and 102, which, taking gamma 2.2 into account corresponds to 2.77x difference, or almost exactly 1.5 stops. It seems that CameraRaw, by itself, added another 0.3EV to the difference, increasing the contrast (this is with all sliders set to “zero”). Consider the following: we’re comparing shots from a Canon and an Olympus E-M1, two shots taken “at ISO 100” (or at least, that’s what the EXIF says). In reality, the Olympus is set to ISO ~220, and the shot was overexposed by 1.25 stops. So, would it be sensible to compare these shots by their noise? The user is lazy and not curious, and is instead interested in the “camera + converter” combination, seeing it as an analog to the “Kodak film + minilab” combination. Both answers have a right to exist, but the second one, in our view, seriously complicates life for those photographers who use two (or more) cameras at once or are switching between different cameras. “Clever methods to increase dynamic range” (ADL, DLO, ADO) – in many cases, these are just done by communicating a higher sensitivity value to the exposure meter, so it’s just underexposure by a stop (or more). But there are exceptions here too. This complicates the problem of finding similar “reference points” even more. As a matter of fact, this particular text was triggered by a certain rather strongly expressed opinion that Olympus E-M1-II runs circles around original E-M1 when it comes to pushing shadows. This camera isn’t supported by Adobe yet, and the only way to run its shots through Lightroom/ACR is by converting it with digiKam and thus setting BaselineExposure to 0. Comparison shots from other cameras, already “known” to Lr/ACR, can be opened directly, without the aid of a third-party DNG converter, and thus (as we discussed above) may have the middle grey calibration point adjusted “the Adobe way”. 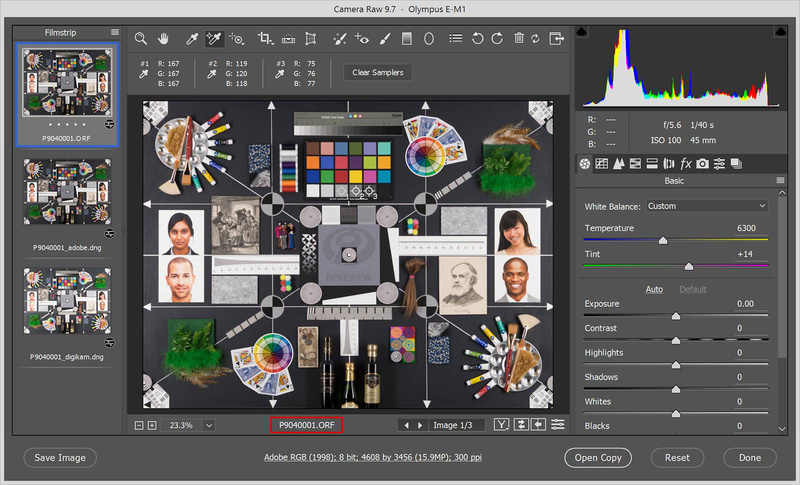 As it happens, an Adobe-supported camera, which means that the calibration to the mid-point will be applied in conversion from RAW (easy to figure out the value of this hidden compensation, but nobody seems to bother), could be compared to a new, yet unknown to Adobe software, camera, with 0 compensation for the calibration point. The results of such a comparison could be as amazing as wrong.